If you enjoy a variety of different drinks but hate having containers and packets of coffee, tea, drinking chocolate and the like through the cupboards, then the Keurig K130/B130 K-Cup Coffee Maker is exactly what you should be looking for. The Keurig brewing system offers much more than other single serve coffee makers on the market and is perfect if you are looking to buy a small coffee machine for the office. The K-Cup Coffee Maker will also fit perfectly into a small kitchen at home or even on an office desk. 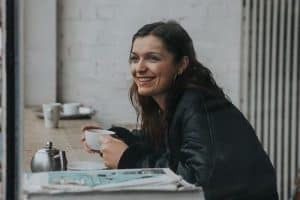 Single serve coffee makers can have many advantages over multi-serve coffee makers purely because you can make smaller amounts without wasting coffee or water. In many single serve coffee makers like the K-Cup coffee machine, you top up the water each time you want to use it, making it healthier and less likely to be using water that could have sat in the machine for days. A single serve machine also means you can have a different flavored coffee each time, or in the case of the K-Cup machine you could have an Espresso Intenso for breakfast, a Pecan Praline Coffee for morning tea, a Raspberry Iced Tea with lunch, a Mandarin Orange Spice herbal tea to get you through the afternoon slump and a Dark Chocolate Hot Cocoa to finish off the night. With so many plain and flavored K-Cups to use in your K-Cup Coffee Maker, it will take you quite a long time to try them all. 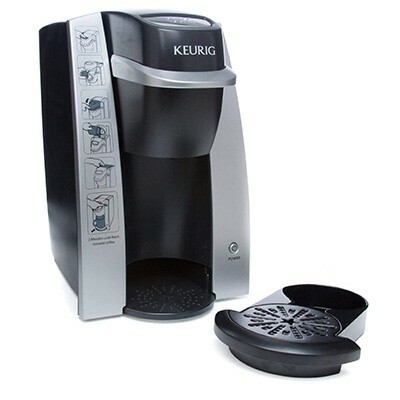 Other advantages to the Keurig K130/B130 K-Cup coffee maker include being able to brew one cup in under three minutes (quicker than waiting at the coffee shop), a mug sensor meaning no spills, no glass pots to clean, no coffee grounds so no filters to clean, an auto-off function and easy to follow instructions on the front, perfect for guests to follow. Keurig offers a large range of K-Cups to be used with the K-Cup machine including many from large beverage suppliers and cafes. The range covers coffee, tea, iced tea, espresso, hot cocoa, specialty drinks and wellness drinks with over 250 different K-Cups to choose from. You will find K-Cup flavors from companies such as Tully’s, Green Mountain Coffee, Cafe Bustelo, Lavazza, Krispy Kreme, Starbucks, The Original Donut Shop, Twinings, Celestial, Bigelow, Snapple, Lipton and Vitamin Burst. Some favorites include Cafe Escapes Cafe Pumpkin Spice, Snapple Raspberry Iced Tea, The Original Donut Shop Sweet & Nutty Hazelnut Iced Coffee and Lavazza Perfetto. You can buy k-cups bulk packs or variety packs to that you won’t easily run out and be caught without your morning fix. Make sure you check out this article for more details of what’s available. This K-Cup coffee maker is a great investment if you are looking for something small. Make sure you check it out.